Your guide to Art Monaco 2016 | What is it worth? The highly anticipated art fair of the French Riviera, Art Monaco returns for its seventh year to Monaco’s famous Espace Fontvieille, which will become a meeting point for the global glitterati from October 27th to 30th 2016. Offering over 4,000 art pieces on display for exhibition and sale, Art Monaco is the perfect place to savour a rich collection of international art whether you are an art enthusiast or a prospective buyer. The incomparable beauty of Monaco doesn’t hurt, of course. Art Monaco is getting together art galleries, cultural institutions, art critics and collectors together since its debut event in 2008. Art Monaco 2016 showcases work from a variety of carefully selected artists, styles and artistic mediums, including acrylic, oil, and watercolor painting; sculpture; photography; antique displays; mixed media; as well as the hand-crafted work of jewelry and furniture designers. One of the works that caught our attention is “The Vegetal Hunter” by Gabriel Brojboiu, exhibited by the Romanian Art Yourself Gallery. 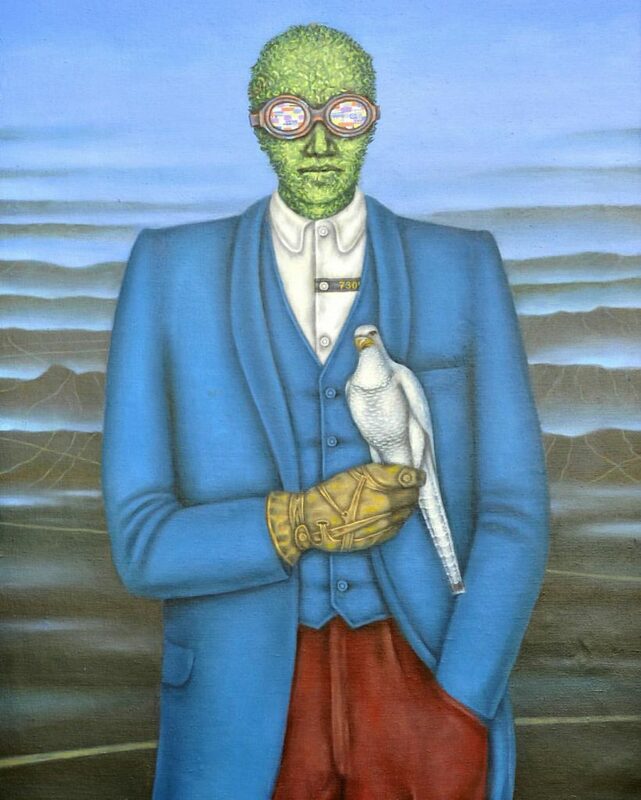 This Magritte-esque painting depicts a man dressed in a blue jacket and vest set, a white buttoned up shirt with the number 730, red pants and a glove on his hand holding a pigeon, as if it were a falcon. The man’s head seems to be from a vegetal materials, maybe lettuce and his colourful glasses remind us this is an alternate reality. The man is hunting vegetables instead of animals, he is made of vegetable instead of meat and he is holding a pigeon to retrieve the vegetable he hunts, instead of a falcon to retrieve the animal he shot. 5 avenue des Ligueres, Monaco 98000.